There are few things more associated with America than barbecue. So, when participants at the Sam’s Club National BBQ Tour stop in Daphne were asked to not fly American flags, as expected, there was outrage. Mayor Dane Haygood said Monday morning that no one with the city told participants to take down flags and that the issue was caused by the event organizers’ misinterpretation of the city’s sign ordinance. 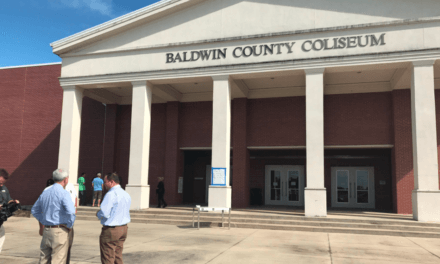 Mike McCloud, national marketing director for the Kansas City Barbeque Society, which puts on Sam’s Club BBQ events nationwide, said during an event in Daphne two years ago, organizers were told by city officials of Daphne’s strict sign ordinance. “There was a pretty clear policy from the city that no flags or signs could be displayed,” McCloud said. Two years ago, McCloud said, no one participating in the event flew a flag and it wasn’t an issue. He admitted that this year’s contest director had probably been “over cautious” in telling participants to not fly American flags while they were setting up in the parking lot of Sam’s Club on Friday. After hearing complaints from a few participants and after about 10 hours of discussion, McCloud said organizers allowed flags to be flown. Flags were in place by the time the competition officially kicked off Saturday. Haygood said flying an American flag in Daphne is encouraged. He pointed out that the city flies at least 100 temporary flags along U.S. Highway 98 and State Highway 181 and into old town Daphne, during at least five holidays per year. City Councilman John Lake said the local Optimist Club also buys flags for any individual who would like to fly flags on their own property. Business owner Kevin Spriggs, an outspoken opponent of the city’s sign ordinance, said he’d be surprised if the law was interpreted to restrict the flying of the nation’s flag. Spriggs did call the ordinance overly strict, especially when it comes to sign height along the Highway 98 corridor, near Interstate 10. The ordinance doesn’t allow for a sign taller than 14 feet, which Spriggs said is nearly useless when competing with large oak trees for the attention of motorists. “That height is totally inadequate because you can’t see because of the trees,” he said. In addition to Malbis Shell on State Highway 181, Spriggs owns Lake Forest Shell and the Eastern Shore Motel on U.S. Highway 98. The weekend’s barbecue competition hosted 30 participants, McCloud said.